Sunset Surfhouse is a cozy environment with a variety of bedrooms fit for a single traveler, a family or a group. We offer shared bathrooms and a fully equipped surf house. Enjoy Moroccan meals such as Tagine or BBQ on our spacious rooftop terrace or chill with good company in our comfy living room. Sunset Surfhouse offers a wide range of activities including surf lessons, yoga classes, and trips to local areas such as the breathtaking Paradise Valley. For your convenience, we offer surf equipment rentals, homemade meals and airport transfers upon request. Our nice weather, excellent waves, exciting activities and local restaurants make Sunset Surfhouse an ideal year-round surf destination. We look forward to your arrival at Sunset Surf House! 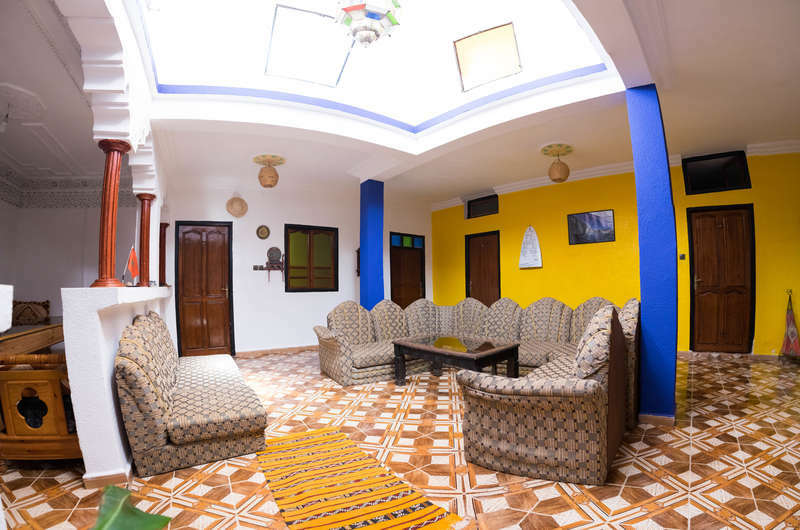 Our Surf House is located in a peaceful village of Tamraght – Taghazout bay, only 14 km from Agadir City & 40 minutes drive from international Agadir El Massira airport. Simple & cozy surf house is close to local shops, cafes & restaurants & a few minutes walk to the nearest surf spots: Devils Rock, Crocro & Banana. Check in from 08:00 to 23:00 .